A readable melting pot sizzling with highlights from the international auction market of vintage design - my fascination with Art Deco, mid-century modernism, classic cars and glamorous Old Hollywood - my tireless hunt for more great finds in the vast fields of Danish flea markets - and personal stories from being a passionate collector with too many obsessions to satisfy. Yeah, just a little bit of everything stylish, elegant and desirable. I hope you will enjoy my sporadic posts. 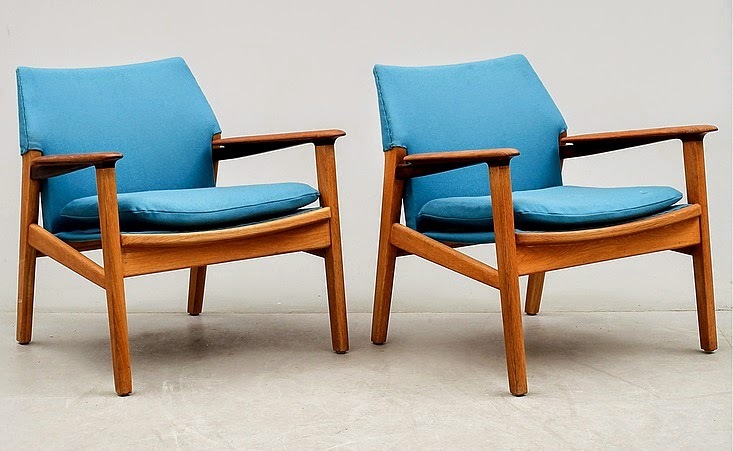 This summer Danish design legends Hans Jørgen Wegner and Børge Mogensen are being celebrated with large exhibitions here in Denmark commemorating both of their 100th year anniversaries. 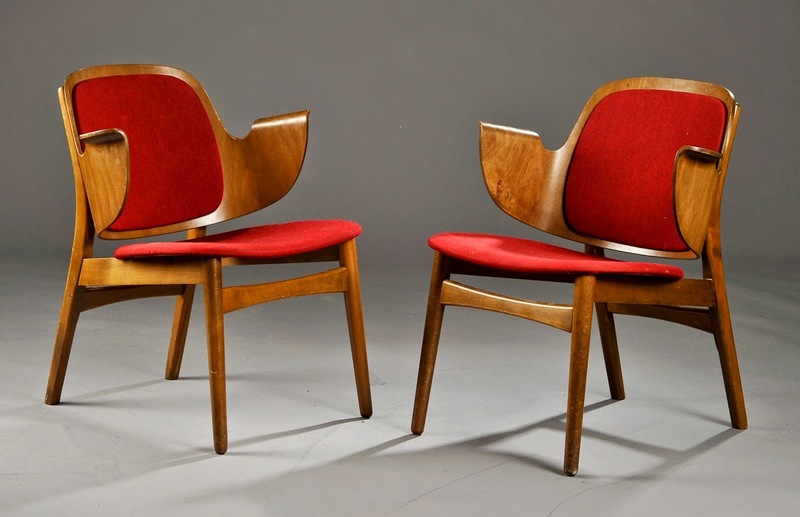 However the celebrated ‘Danish modern’ movement of the postwar era is not all about these two gentlemen or other esthetic heavyweights like Finn Juhl, Arne Jacobsen and Poul Kjærholm. 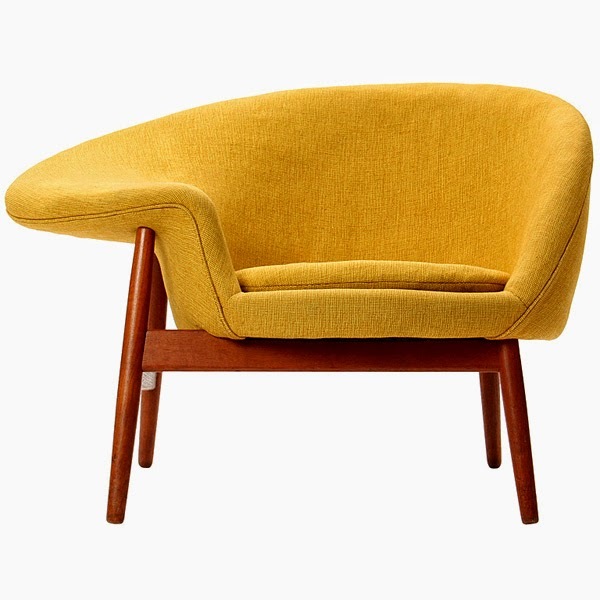 In the shadows of desirable icons like the Egg chair, PK31 sofa and Judas dining table you’ll find equally valuable treasures by lesser known Danish architects like Kurt Østervig, Illum Wikkelsø, Ib Kofod-Larsen and the duo Hvidt & Mølgaard to name a few. Poster by Danist artist Ib Antoni (1965). 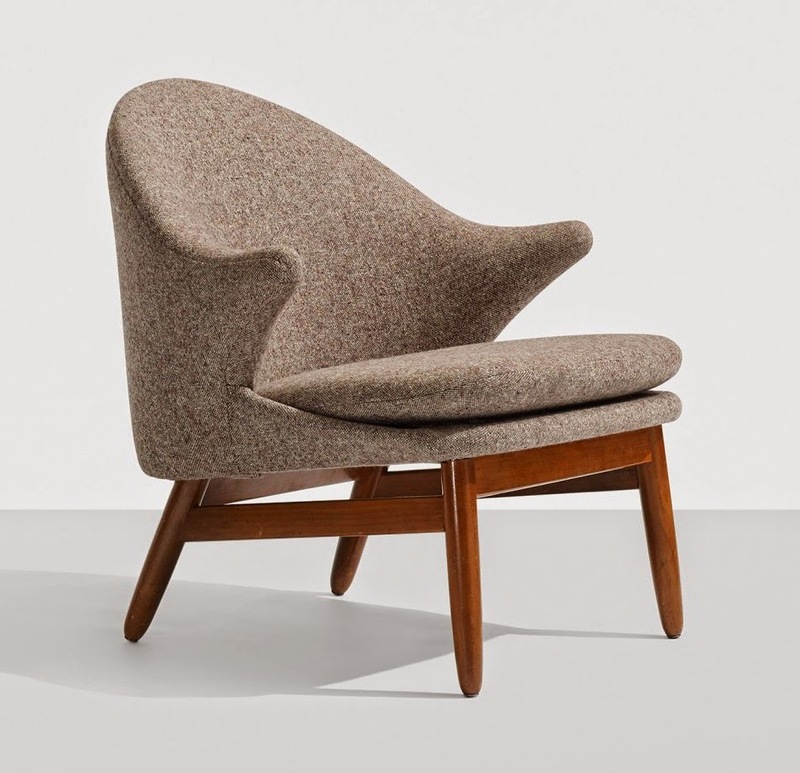 With Scandinavian design continuously reaching groundbreaking sales results at premier auction houses like Wright, Phillips de Pury and Denmark’s own Bruun Rasmussen the hunt is on for the next big find. 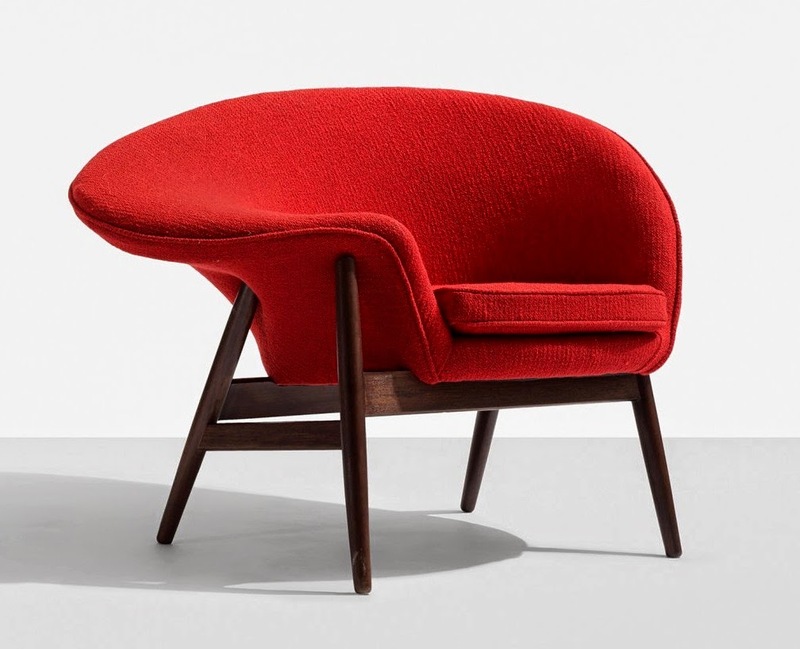 The increasing demand for rare and preferable unique pieces by collectors worldwide fortunately brings much deserved attention to the works of lesser known Danish designers and architects – and unfortunately makes prices skyrocket in particular cases for pieces previously obtainable for the common Danes. 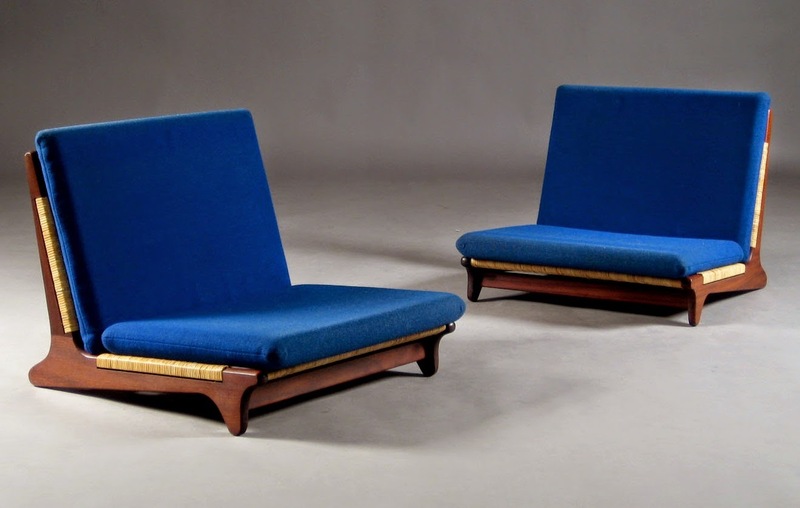 The recent inclusion of two beautiful easy chairs by Hans Olsen at Wright’s annual auction for vintage Scandinavian design made me want to focus on the work of this unusual Danish architect. Similar posts about his colleagues mentioned above will follow in the future. To my knowledge I’ve made the most comprehensive bio of Hans Olsen available online. If anywhere. I must admit that when I started writing this post I surely hadn’t imagined that it would turn out to be such a extensive project. It especially took a lot of time finding images of a prober quality. Information about the persona and career of Hans Olsen is very scarce and this is all what I’ve managed to gather through the net and my books. 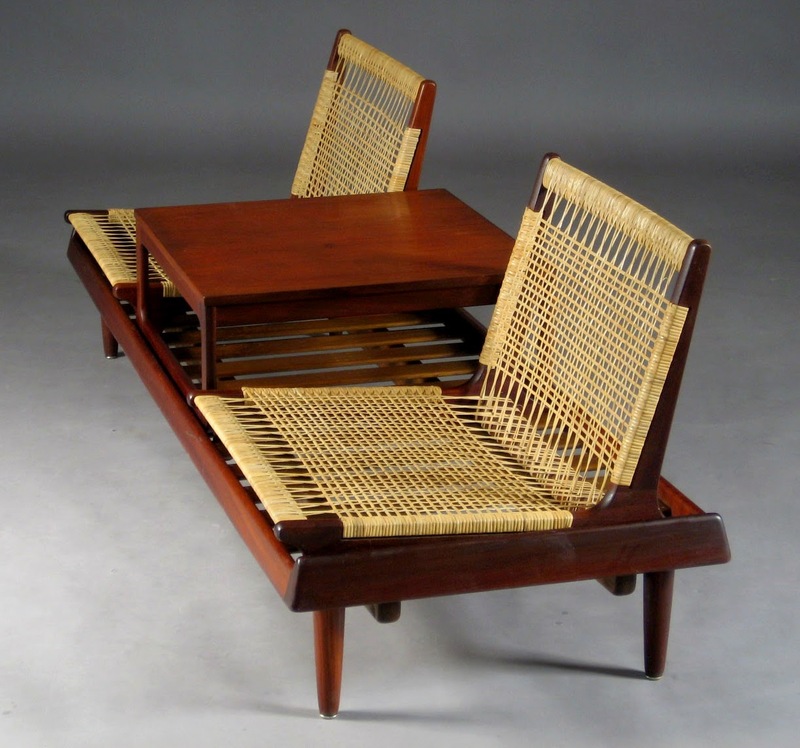 Hans Olsen was born in 1919 and finished as a cabinet maker in 1941. 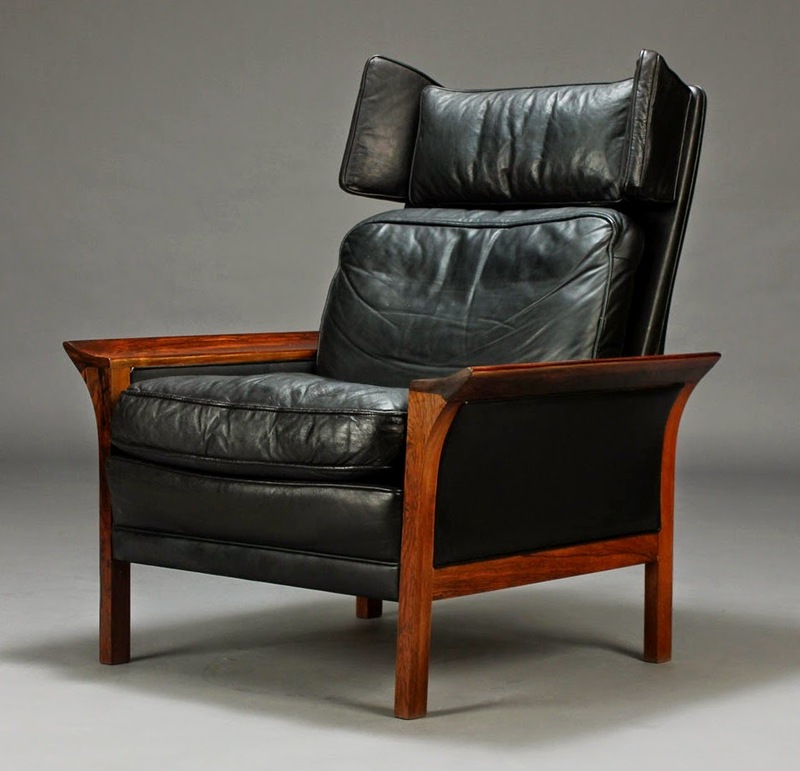 He shortly after became a student of Kaare Klint at the Royal Danish Academy’s Furniture School and graduated in 1943. 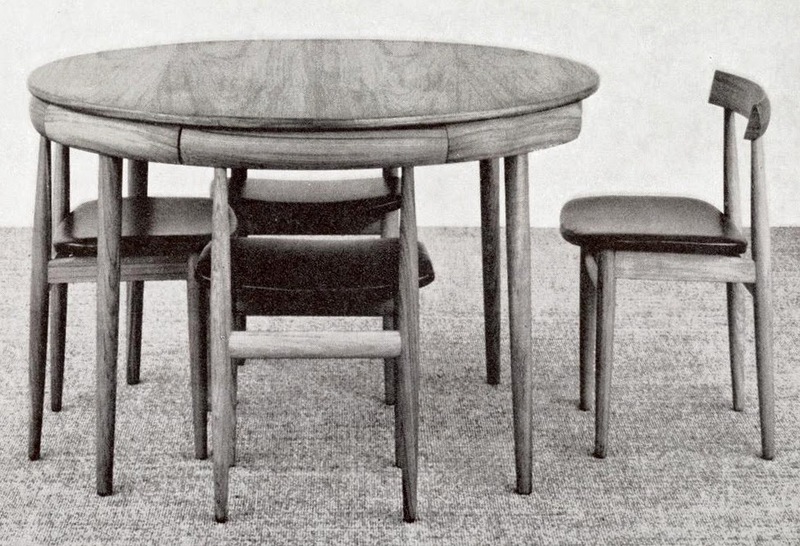 Olsen ran his own studio from 1953 with much success and exhibiting his distinct style at the annual fairs of the Cabinetmakers Guild in Copenhagen. Olsen passed away in 1982. 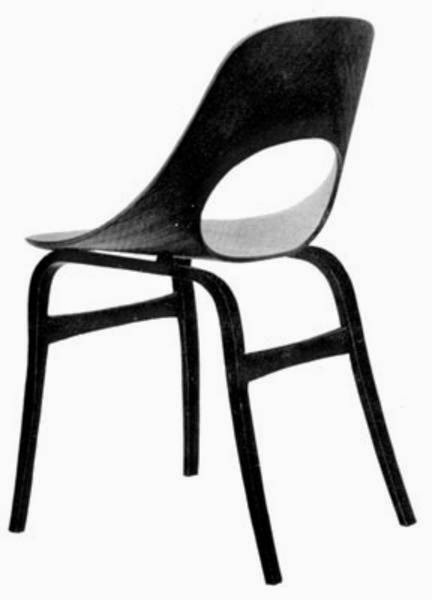 The following examples are most frequently seen designs by Hans Olsen. Well, here in Denmark anyway. 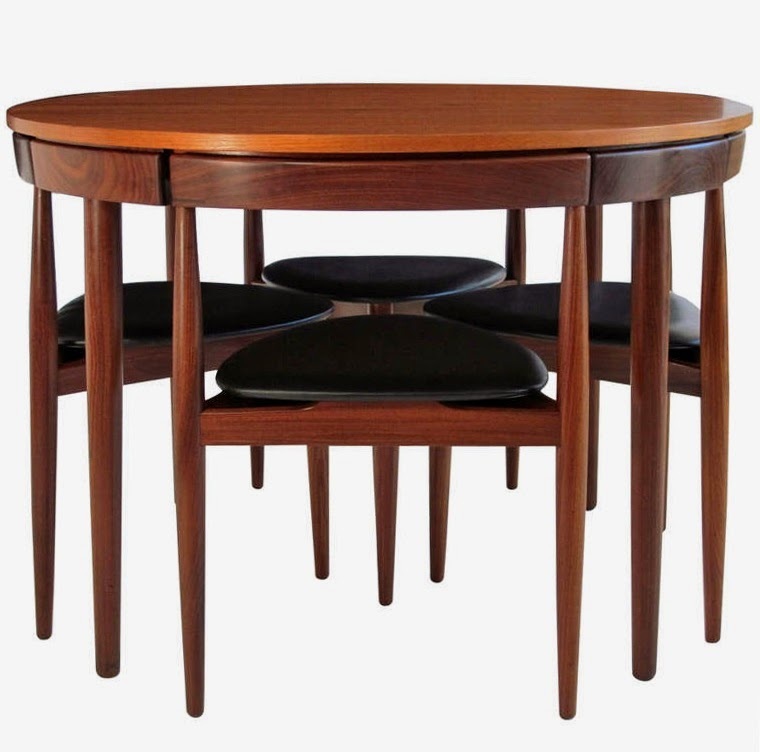 First, a ‘Roundette’ dining set designed in 1952 for Frem Møbelfabrik. 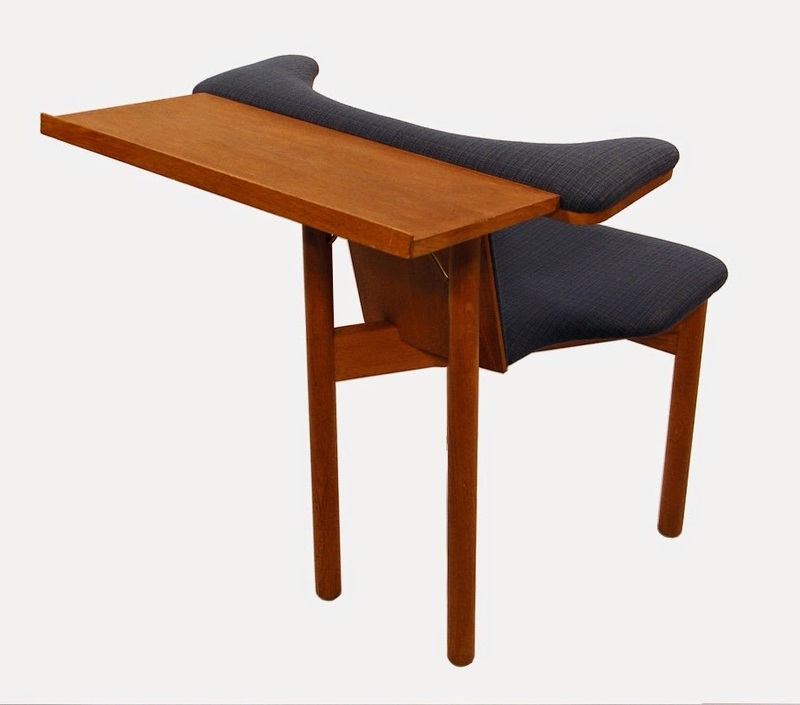 Note how the back of the chair cleverly fits into the edge of the table. A both elegant and space-saving solution. 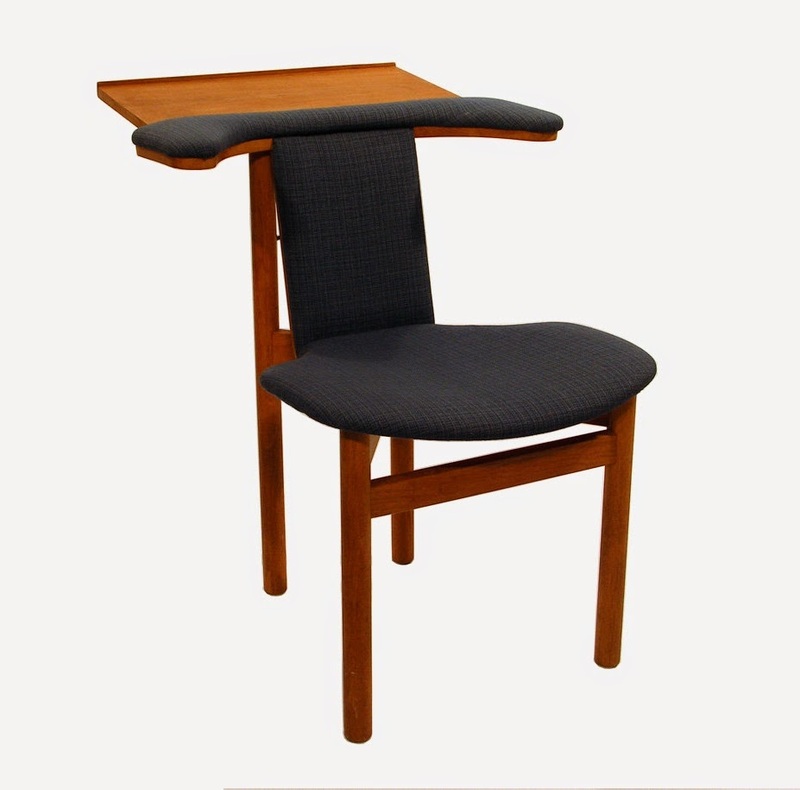 The chairs were also produced with 4 legs and a different back rest matching the slight change to the table edge. 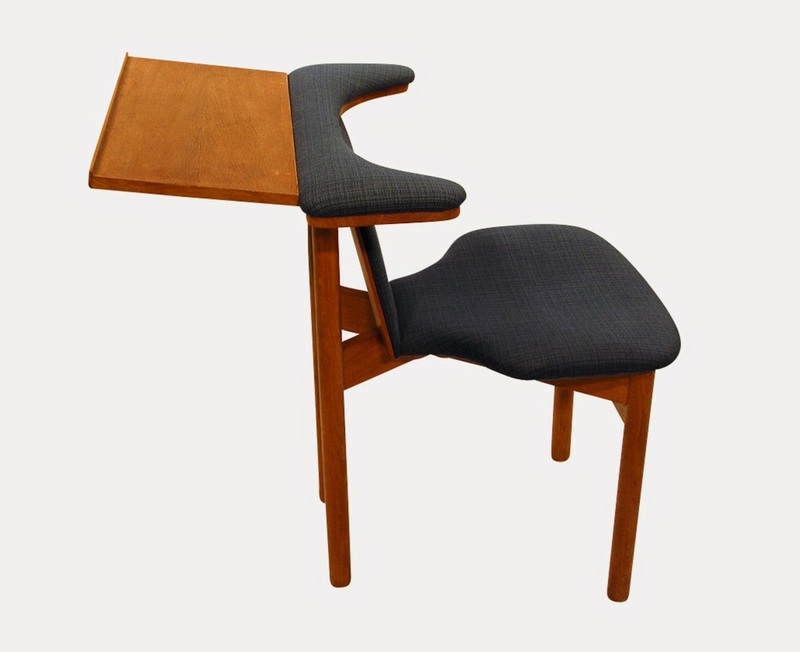 As a quick note I’d like to show this lesser known variant where the back of the dining chairs protrudes above the tabletop for an easy grip. 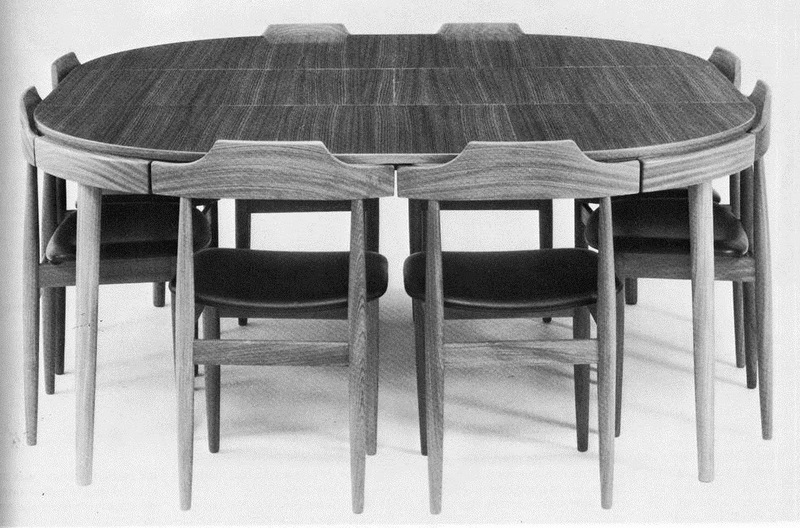 The chairs are shown with a special dining table that could be expanded from its basic circular shape into an oval and then further into a rounded square by adding leaves hidden in the table’s structure. 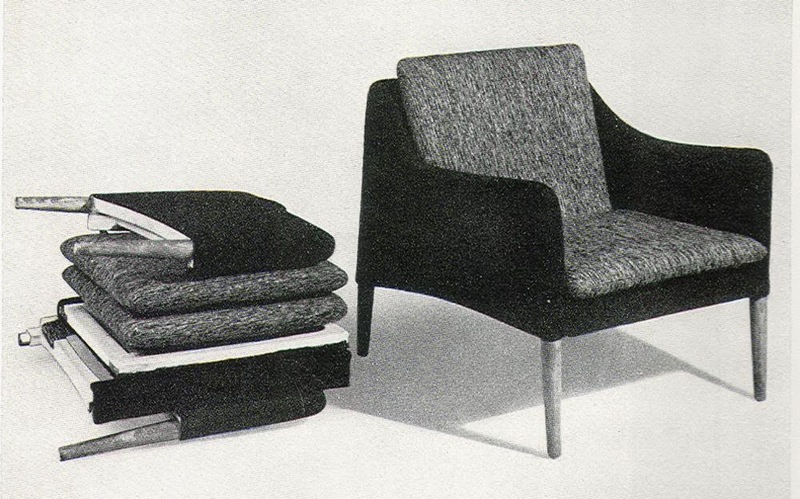 It appears to be Olsen’s last design as the source to the picture below is a Mobilia magazine from 1975 (no. 243). 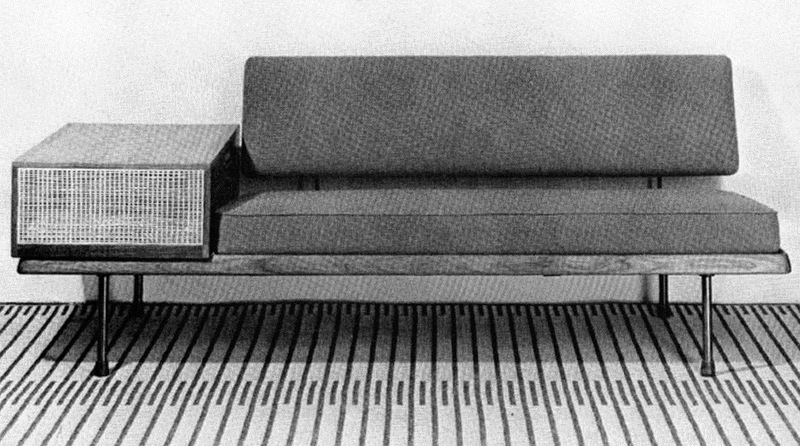 Second, the CS500 series designed for Christian Sørensen & Co. (aka C/S Furniture) in 1962. 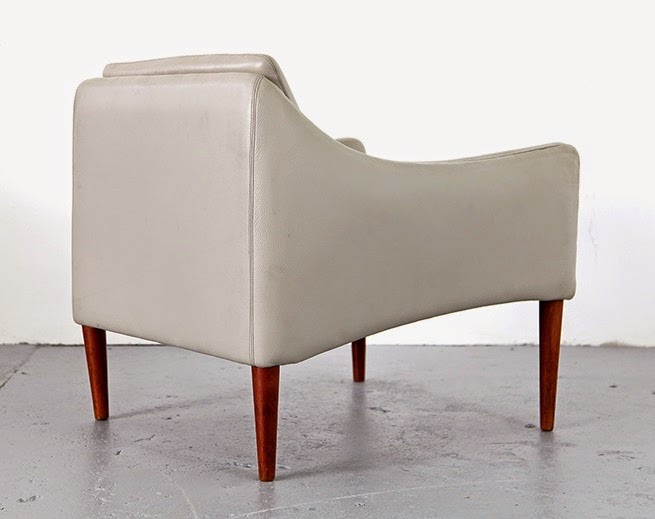 Available with either upholstered or wooden armrests, all pieces could also be ordered with a low or high back. 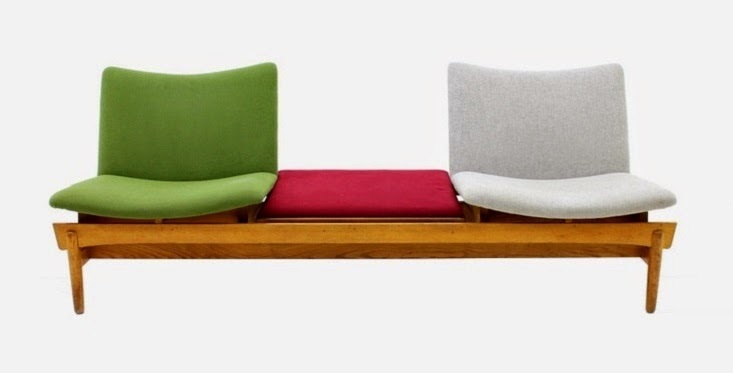 It is a design that Olsen would revisit through the years and continuously refine creating very similar upholstered furniture series with subtle differences to esp. 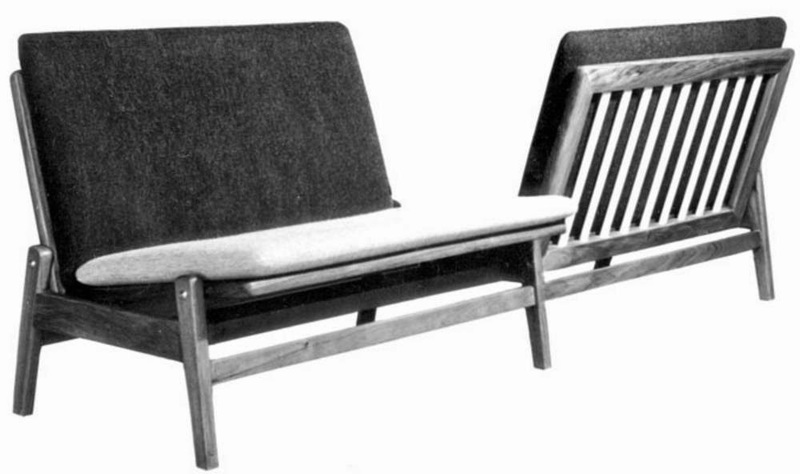 the wooden frame and armrests. by Brdr. Juul Kristensen. 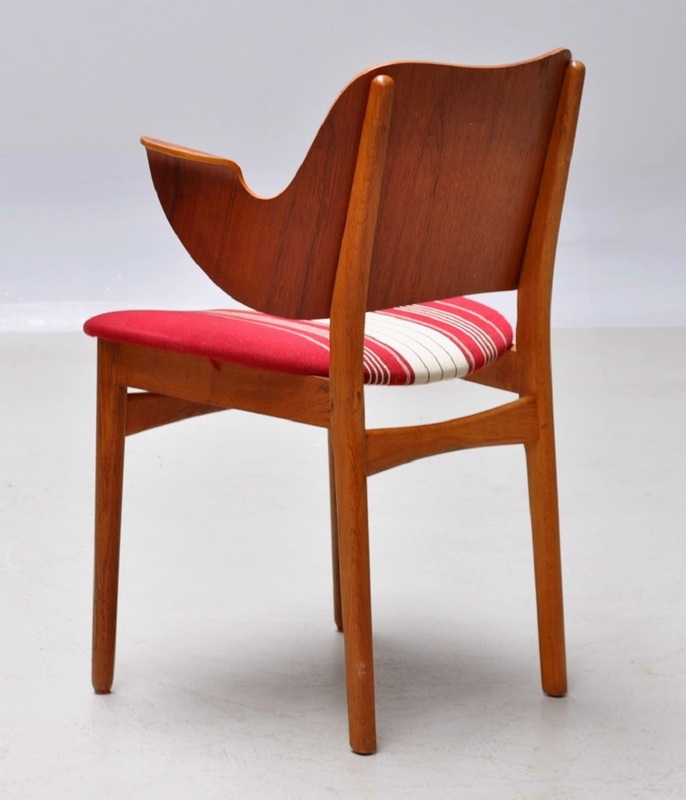 Another frequent guest at the Danish auction houses. Although esthetically pleasing, functional and comfortable these pieces do not have sufficient charisma to rescue one from eternal public oblivion. 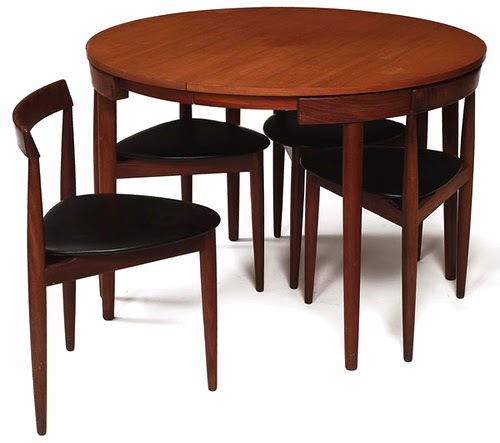 While classically trained as an architect under Danish design legend Kaare Klint’s watchful eye, Olsen was much more experimental than the traditional “Klint school” in his take on creating furniture. 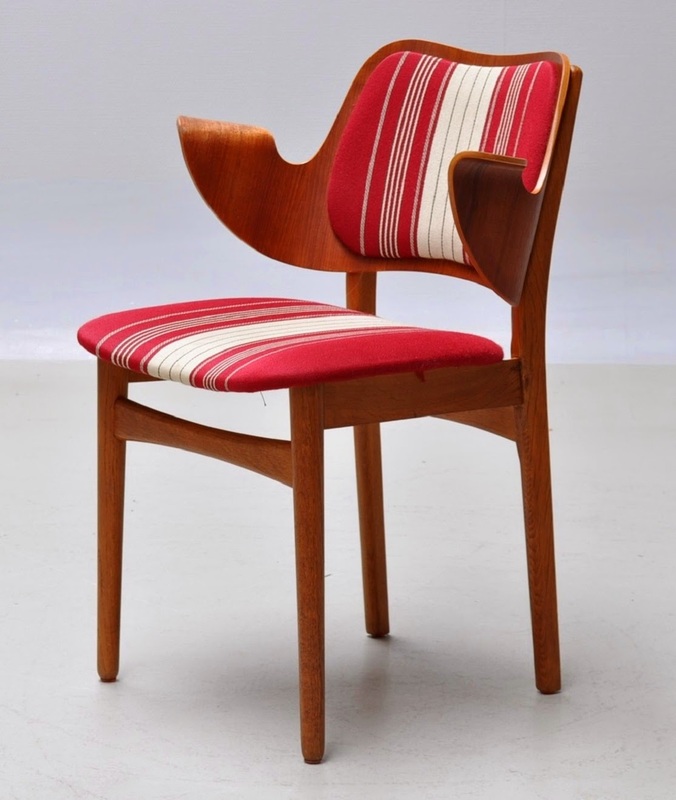 Especially his fondness of using bent laminated wood (aka plywood) resulted in some of Olsen’s best designs, desirable even today, and helped him gain a reputation as a serious player on the Scandinavian design scene. 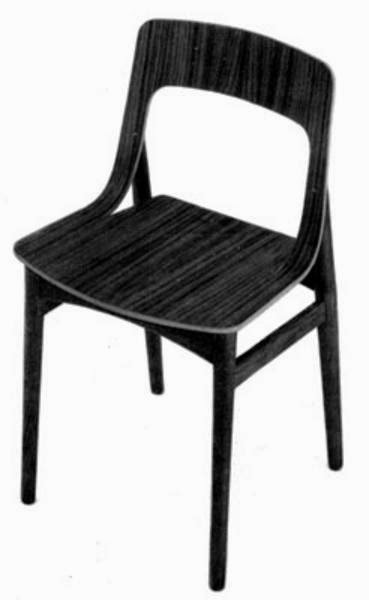 This first example is a simple but clever design as the seat and backrest of this dining chair is formed from a single piece of bent plywood. 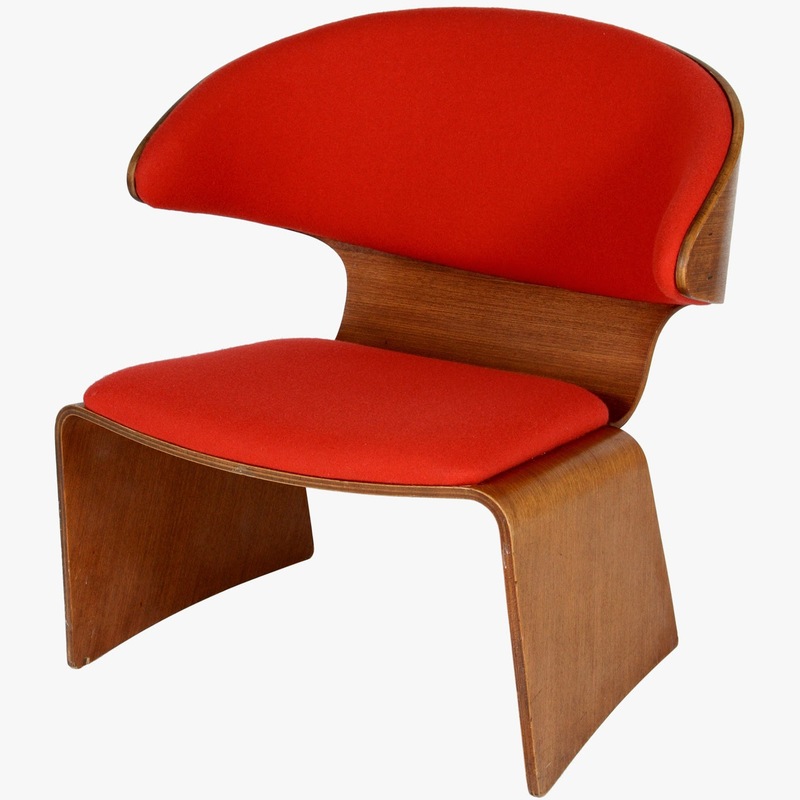 Created in 1955 and produced by Olsen’s long term collaborator, N.A. Jørgensen. 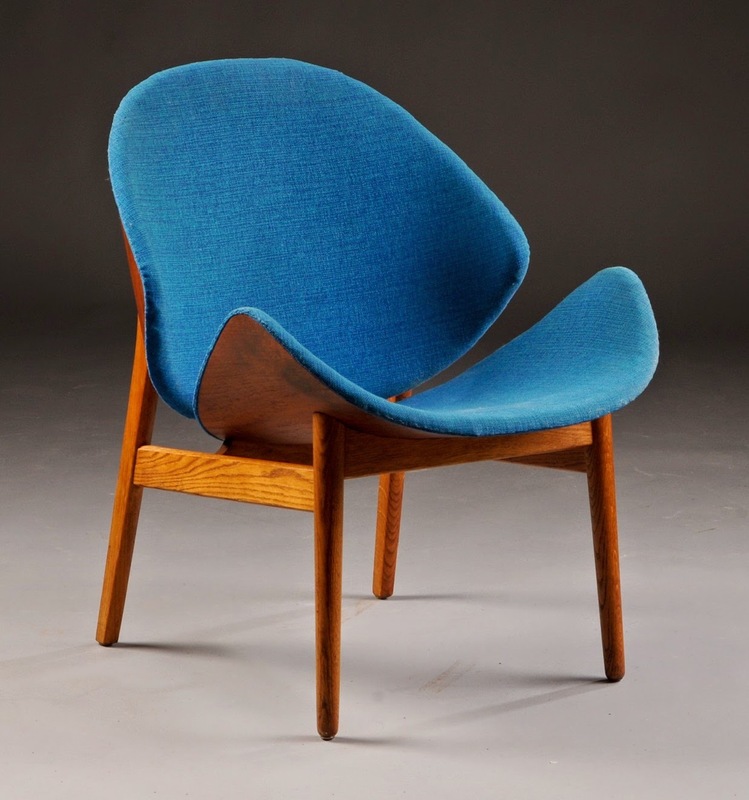 Olsen also designed this beautiful shell chair in 1955 for N.A. Jørgensen. 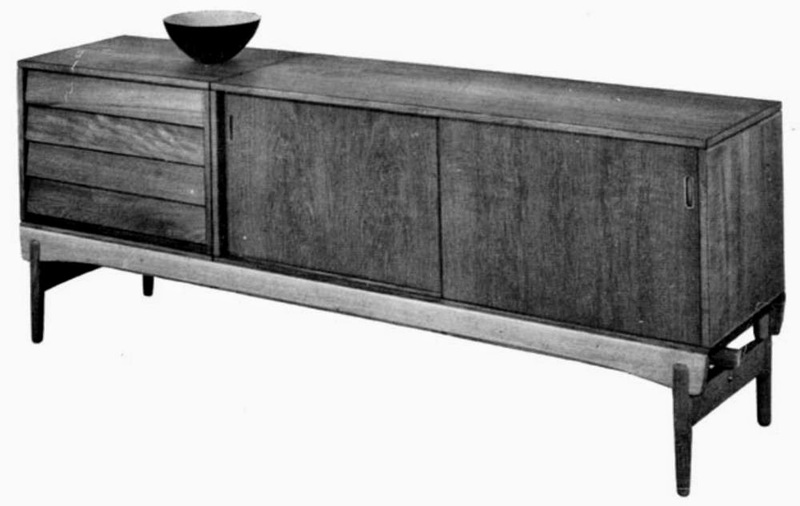 Today it can be found in premier furniture stores dealing with vintage design. its time and received much attention in the press for its futuristic lines and confident attitude. Even now, 53 years later, it still looks completely contemporary. created by Olsen for N.A. Jørgensen in 1957. 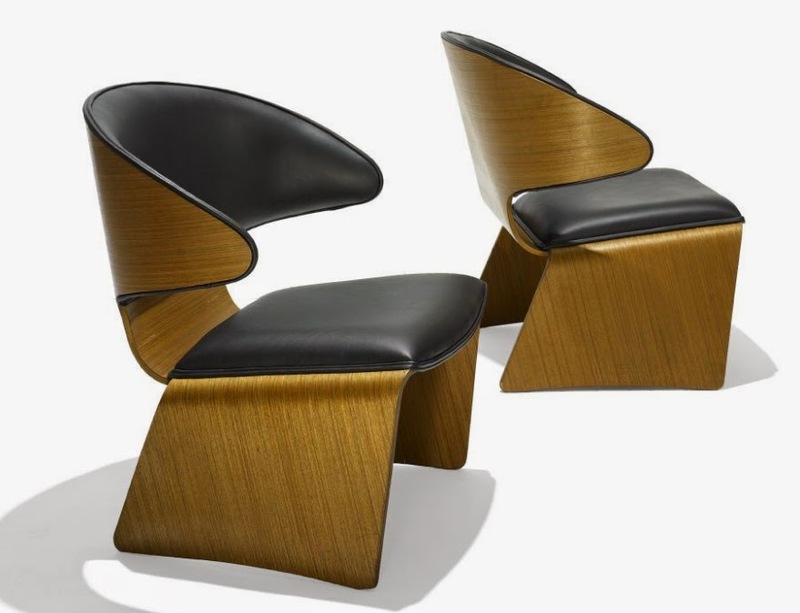 I’m not sure if this model was further developed into the similar examples below or whether this similarity has simply caused Olsen to be continuously misquoted as the designer of these chairs. 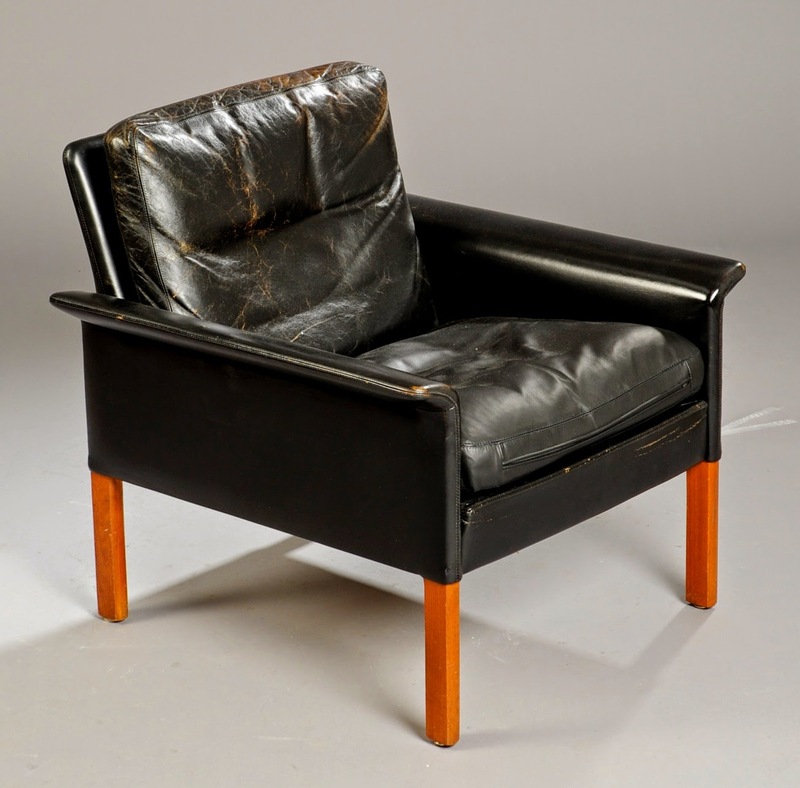 I’m sure the majority of people selling chairs like those below, whether private or working at auction houses, have not seen the original b/w photo of model 163. But with Olsen being known for his experimentations with bent plywood, maybe it just seems like an obvious conclusion to make and now this possible misquotation is firmly established. While the overall design of these pieces share the same idea there are very clear structural differences upon closer inspection, esp. in regards to how the bent plywood back is supported by the frame. 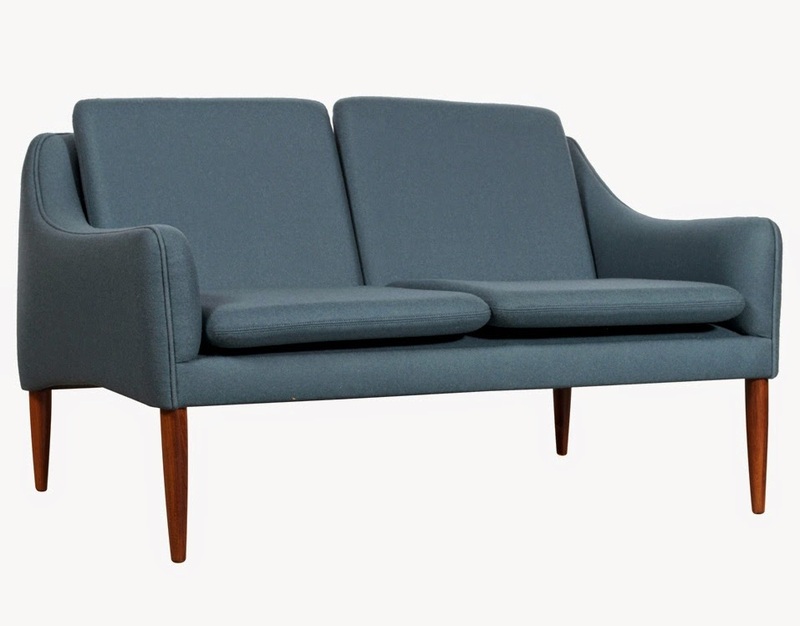 Olsen also created a wide range of upholstered furniture with beautiful, curvy lines. 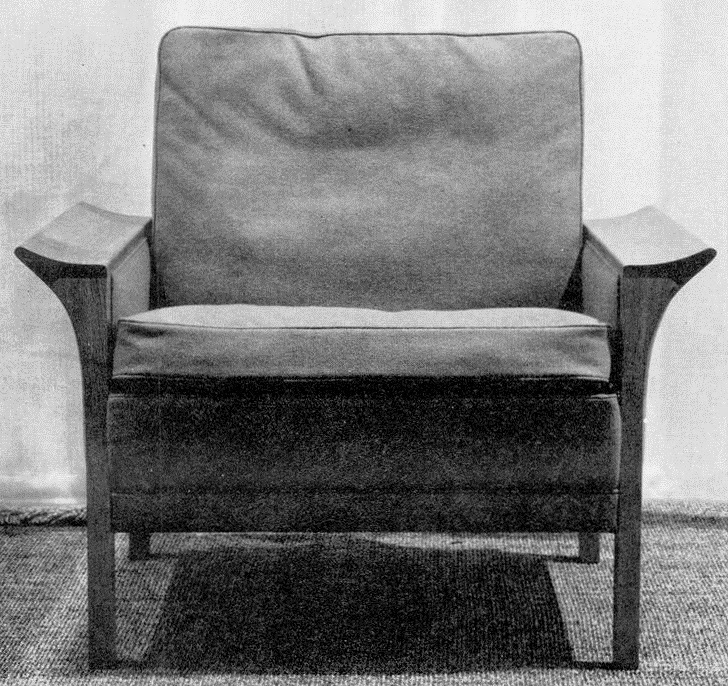 The easy chair below was originally designed as a knock down piece for C/S Furniture in 1955.
chair in a flat package to be assembled by customers themselves in present day IKEA-style. Nevertheless the design was relaunched in a updated, factory-assembled version as the CS800 series in 1956.
or at least proved inspirational for the masculine CS400 series launched in 1966. 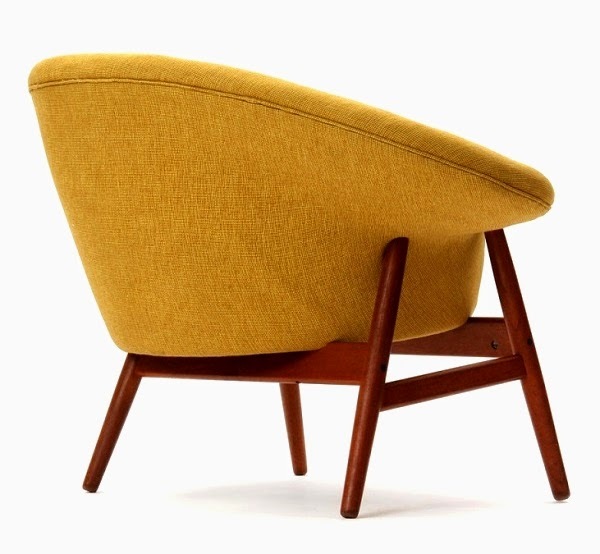 This beautiful easy chair was designed in 1956 and produced by Jørgen Jørgensen. 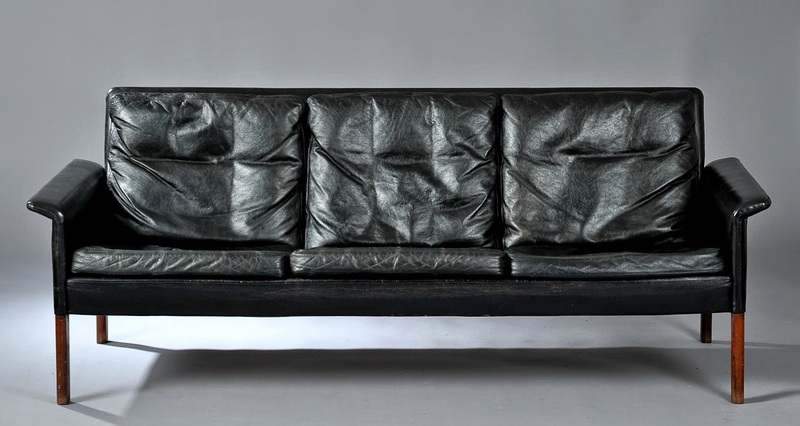 This particular example was sold in May 2014 at Wright in Chicago for $3125 incl. buyer’s premium. 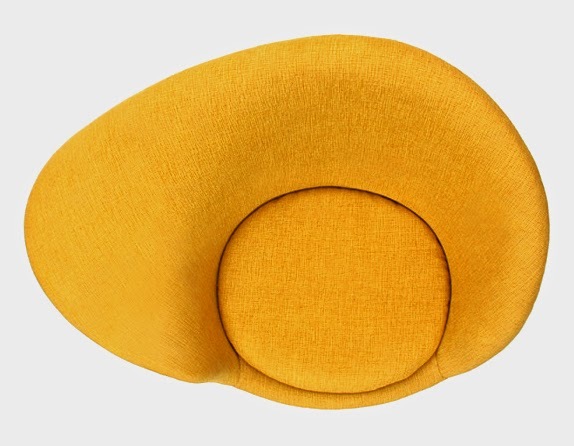 One of my favorite mid century designs is the 'Fried Egg' chair designed in 1956 and produced by Verner Birksholm. 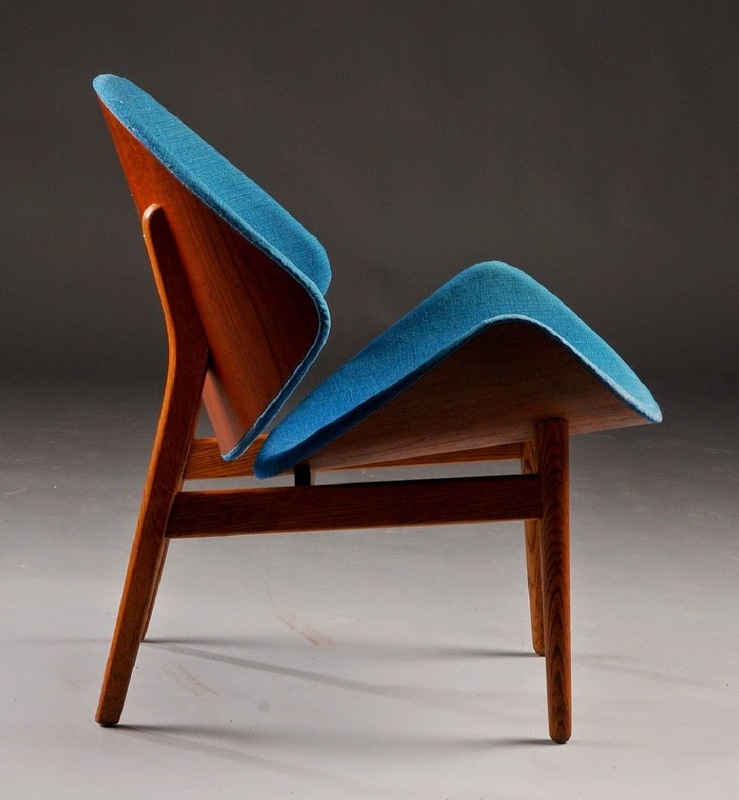 Words can simply not express how much I would like to own this chair. 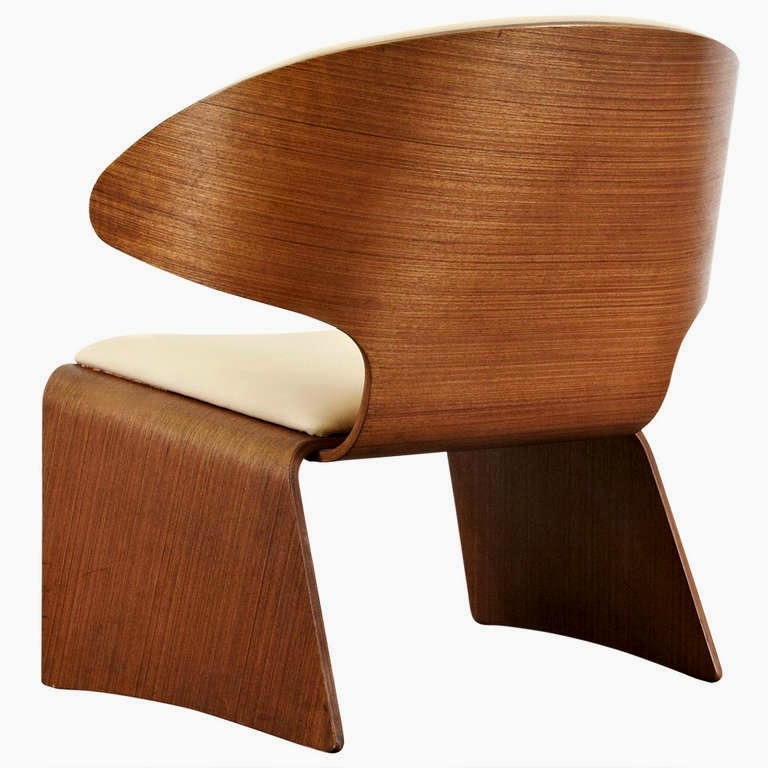 Why this chair has such an unusual name is clear from the first picture with a little imagination. 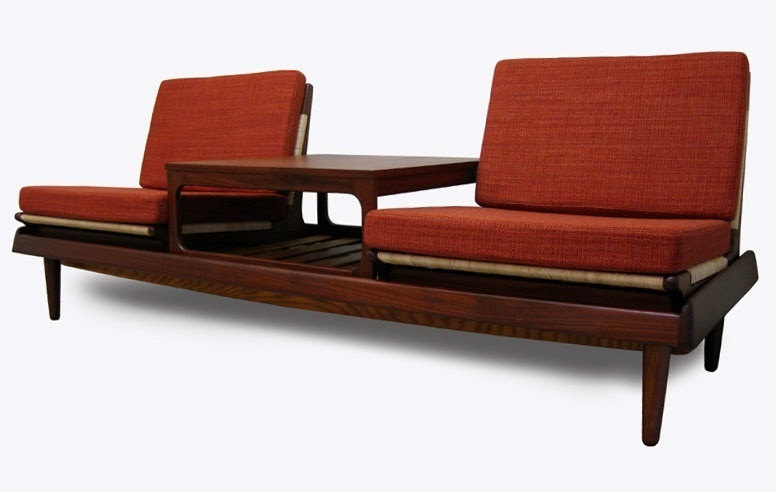 This particular example was also sold in May 2014 at Wright in Chicago for $7031 incl. buyer’s premium. from 1955 featured a more traditional visible construction. 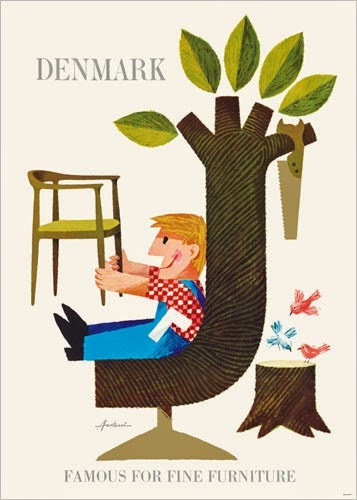 Produced by Verner Birksholm. 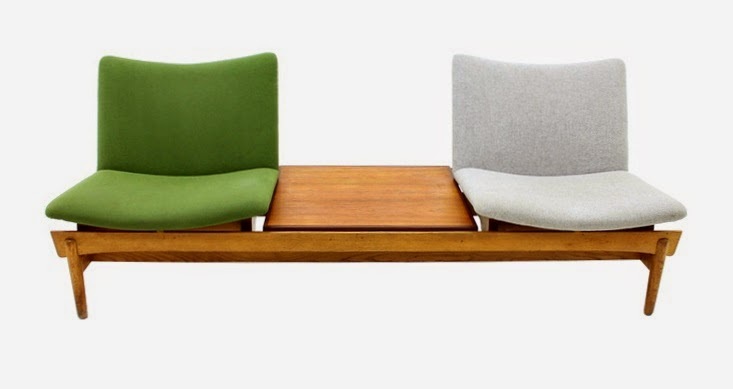 showed a keen interest in creating modular furniture for a modern and more relaxed way of living. 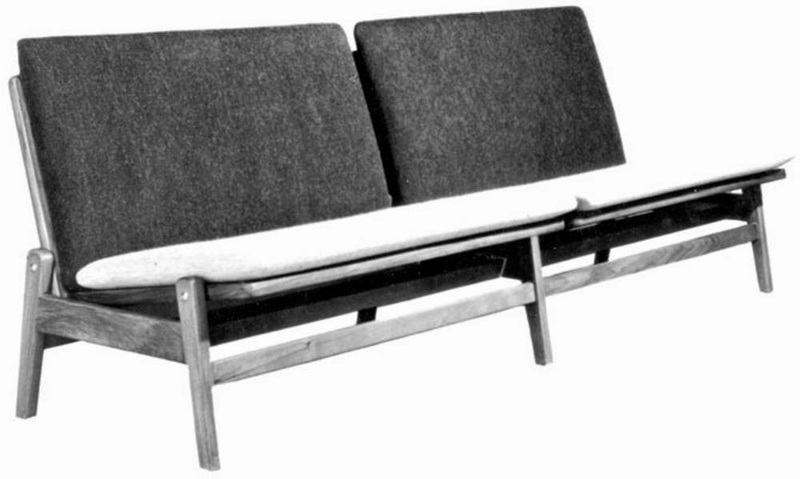 This resulted in Olsen’s desirable 'TV-bench' designed in c. 1956 and produced by Jørgensen Møbelfabrik. could be left on the bench and provide extra seating space. Both 2, 3 and 4 seat versions were made. This model seems to have been particular popular in and around the sunshine state of California, USA. 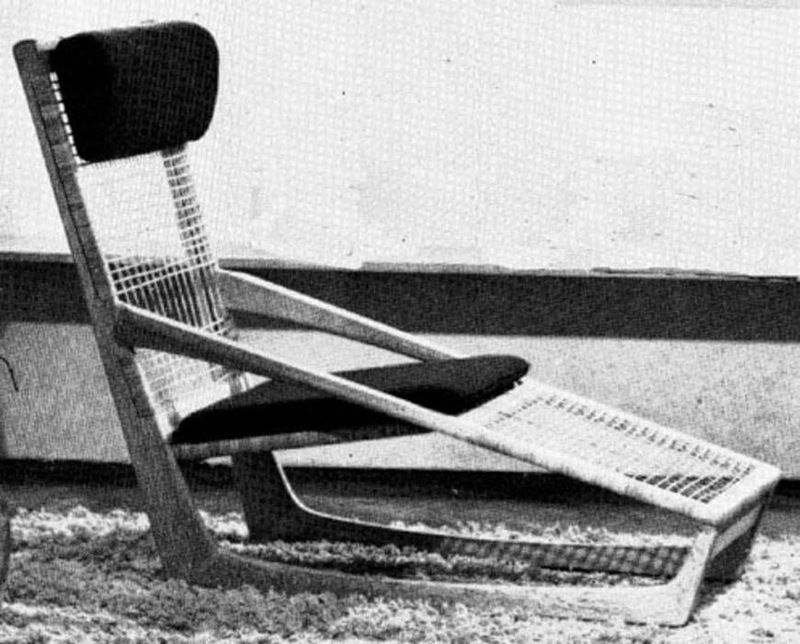 The picture below is from the highly influencial architectural experiment, the 'Case Study House' program, launched in 1945 by the Arts & Architecture Magazine. 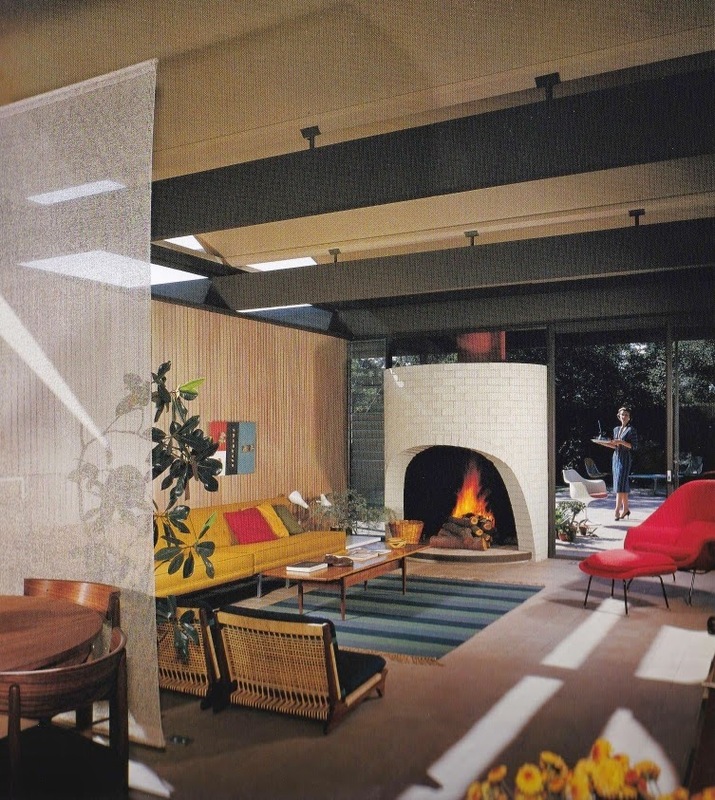 The interior is from CSH house #20, known as the Bass House, completed in 1958. 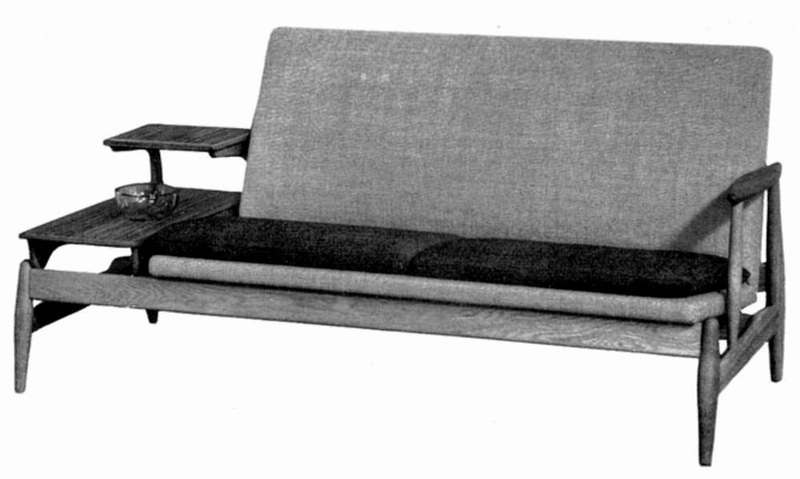 A modified version, 'System 137', followed in 1957 featuring fully upholstered seats. The table top in the middle is reversible and has a cushion attached on the opposite side. 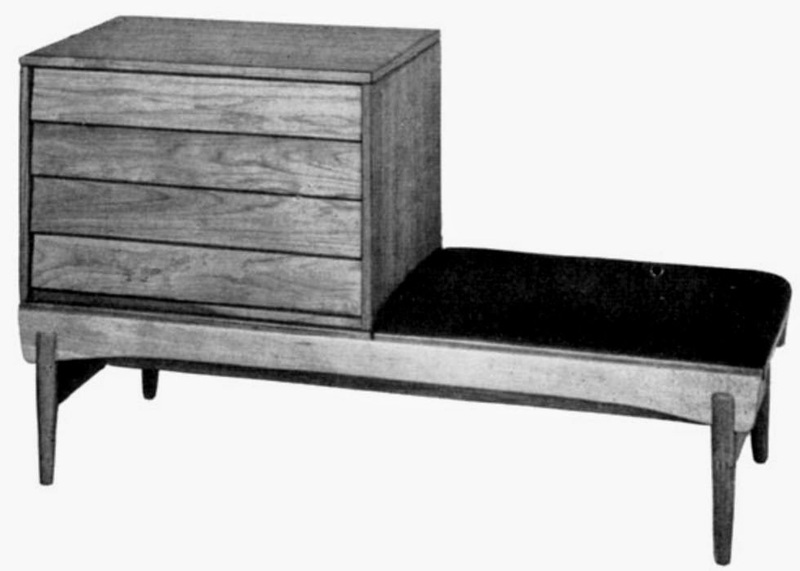 System 137 also provided storage solutions based on the same basic frame. 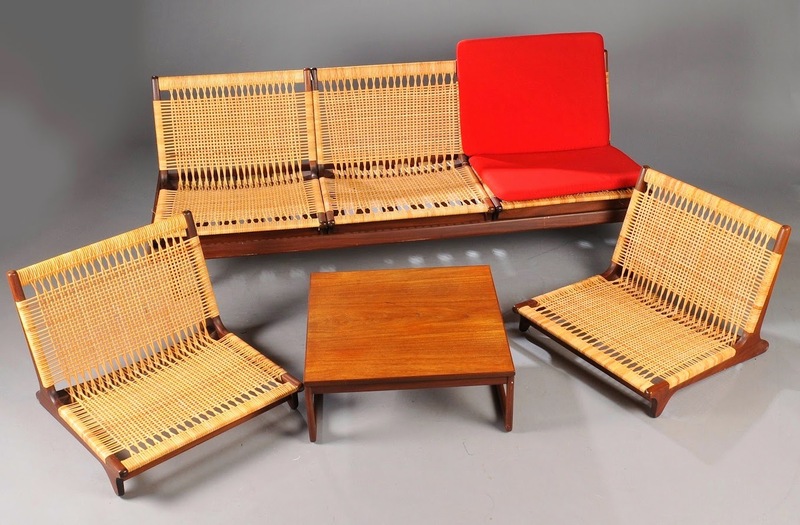 furniture pieces in the mid 1950’s including these examples. 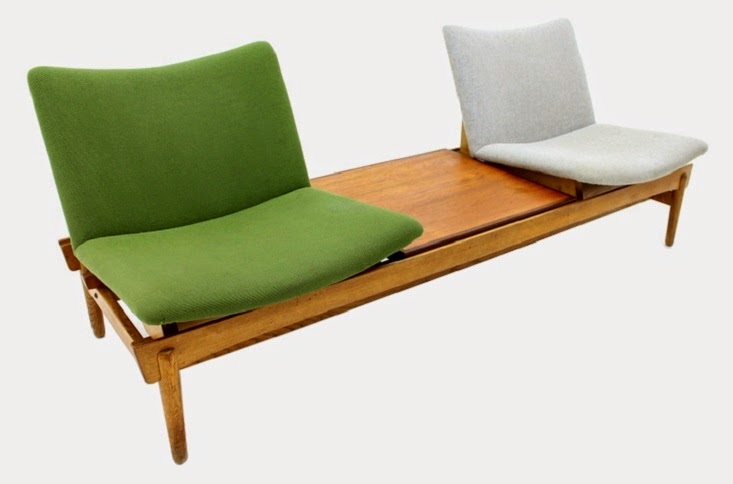 Bench with reversible seats - Verner Birksholm - 1955. 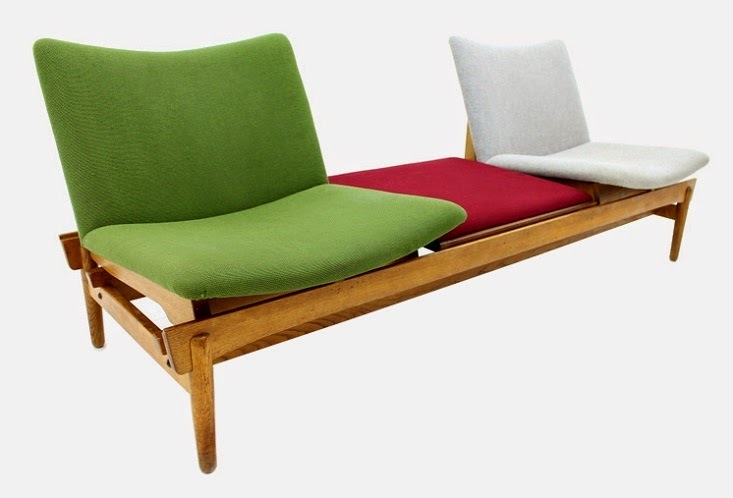 Bench - Verner Birksholm - 1956. 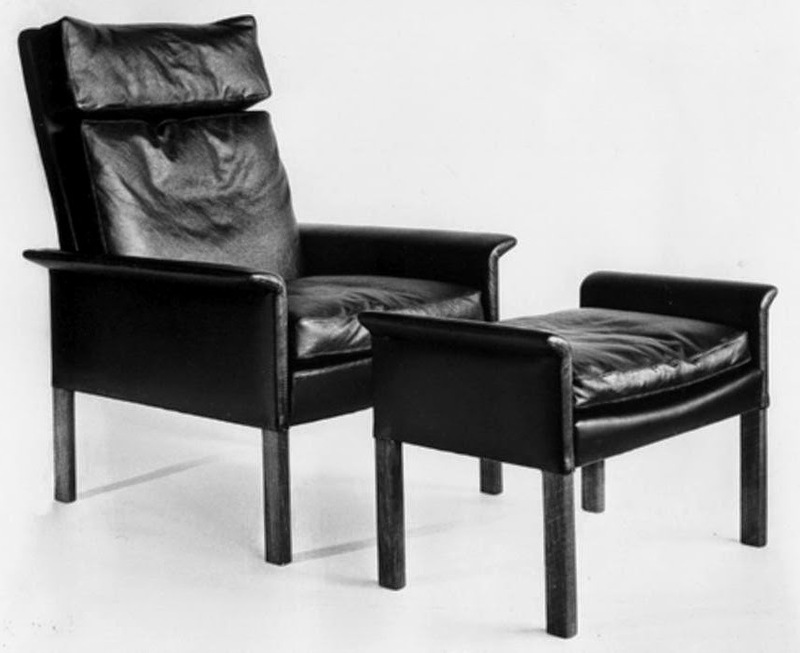 'System 1225' - Hovedstadens Møbelfabrik - 1956. 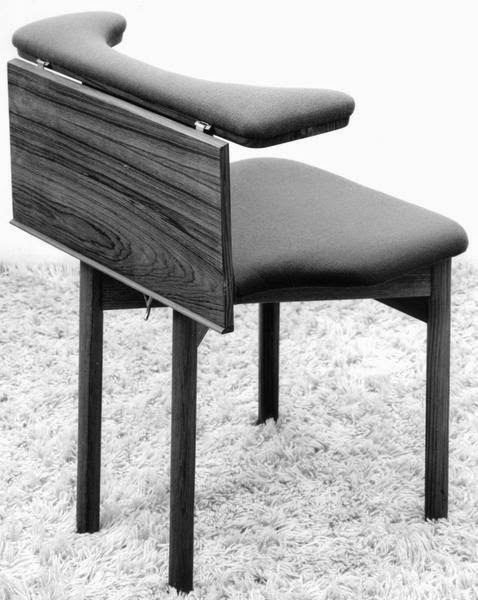 The most unusual chair to come from Olsen's constant experimentation must be the 'Frederik the 9th' chair. 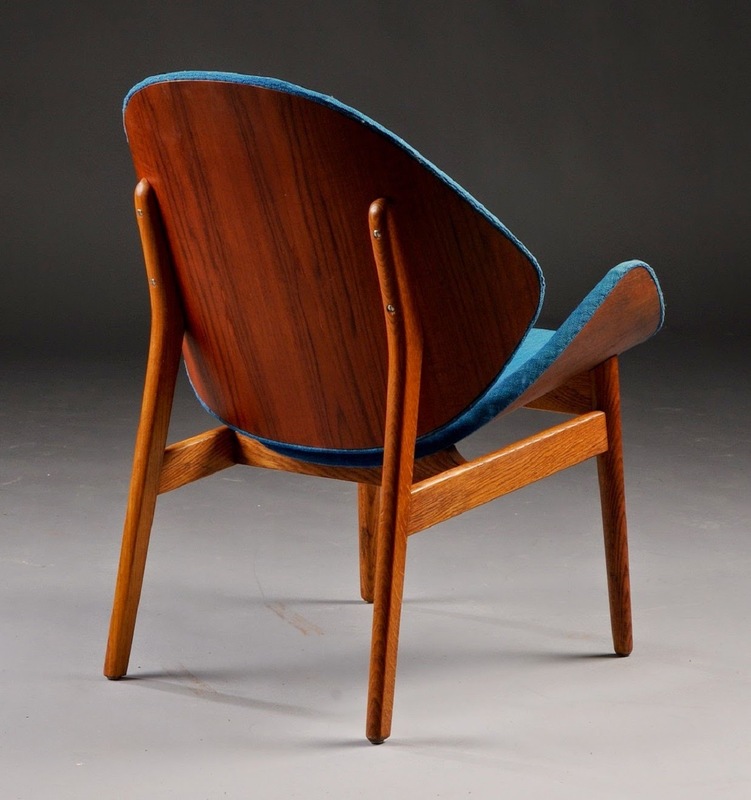 Designed in 1964 and produced by M. J. Rasmussen, this chair got its name from the Danish King Frederik VII who was supposedly very fond of sitting backwards. 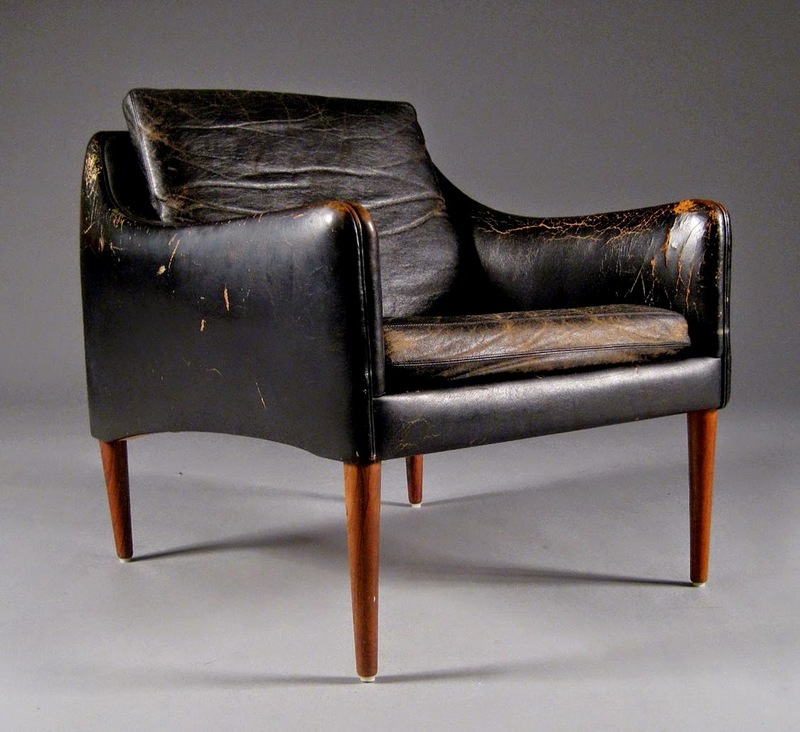 Olsen’s inspiration came from an old chair at Rosenborg Castle in Copenhagen, a former residence of the Danish royal family now turned into a museum. This modern reinterpretation won Olsen the A.I.D. 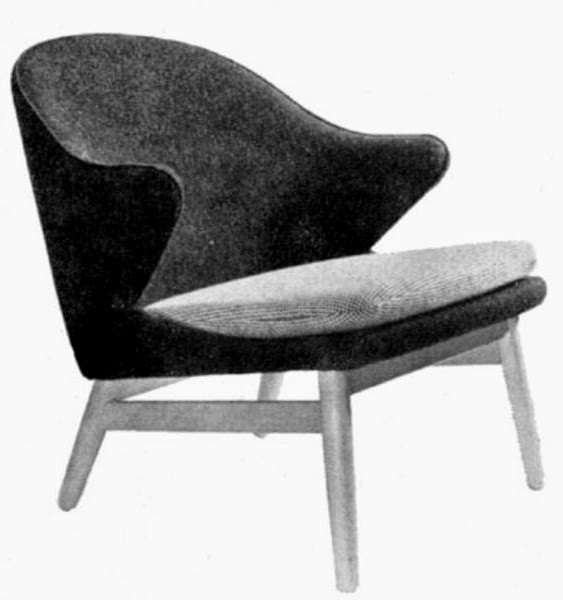 gold medal (American Institute of Interior Designers) in 1965. 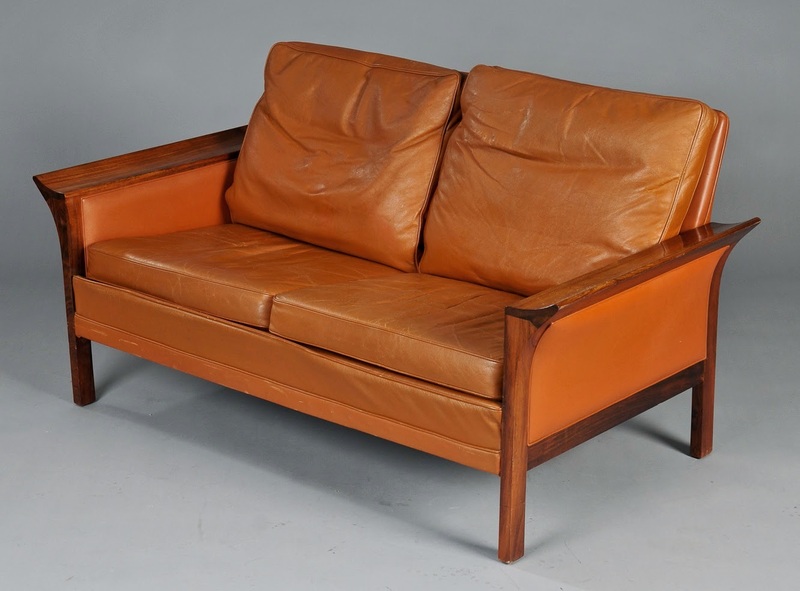 More beautiful furniture by Olsen can be seen in these original photos. 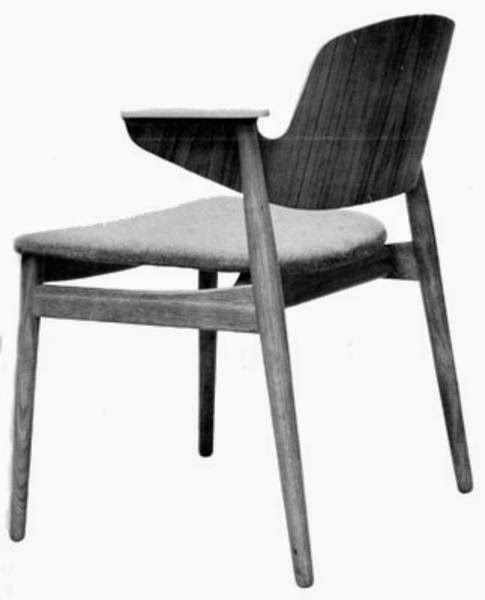 Dining chair (model 208) - Falster Møbelfabrik - 1956. 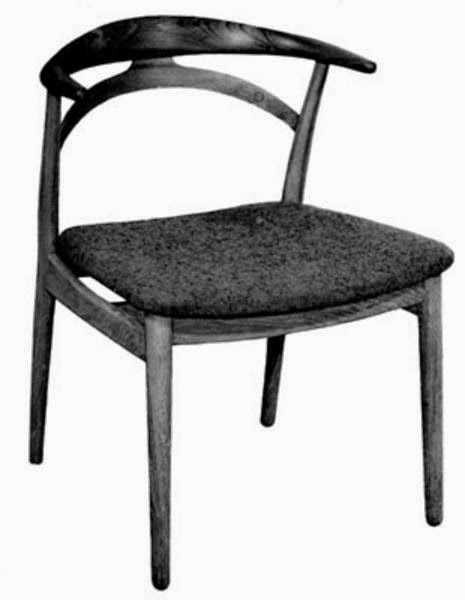 Dining chair (model 149) - N.A. 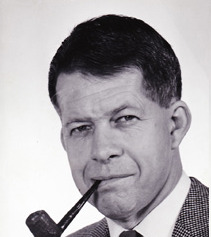 Jørgensen - c. 1956. 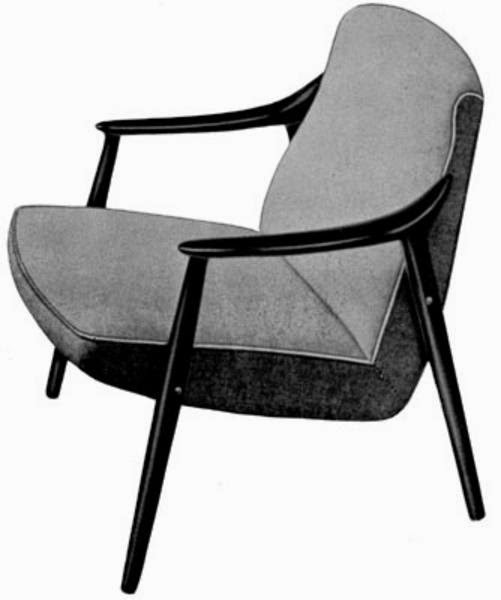 Easy chair - N.A. 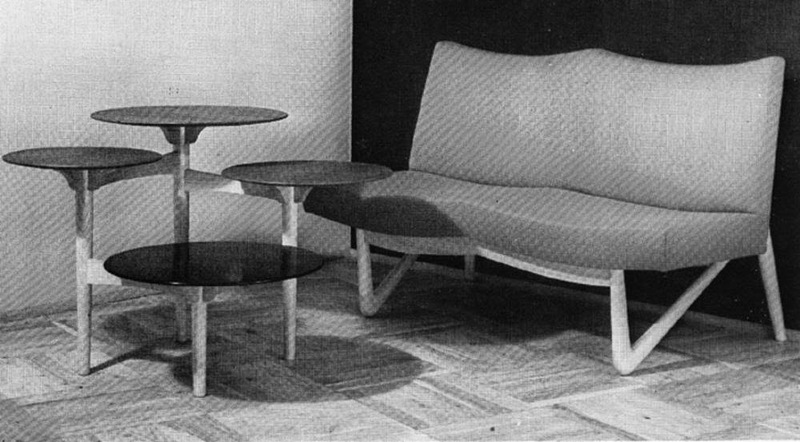 Jørgensen - c. 1957. 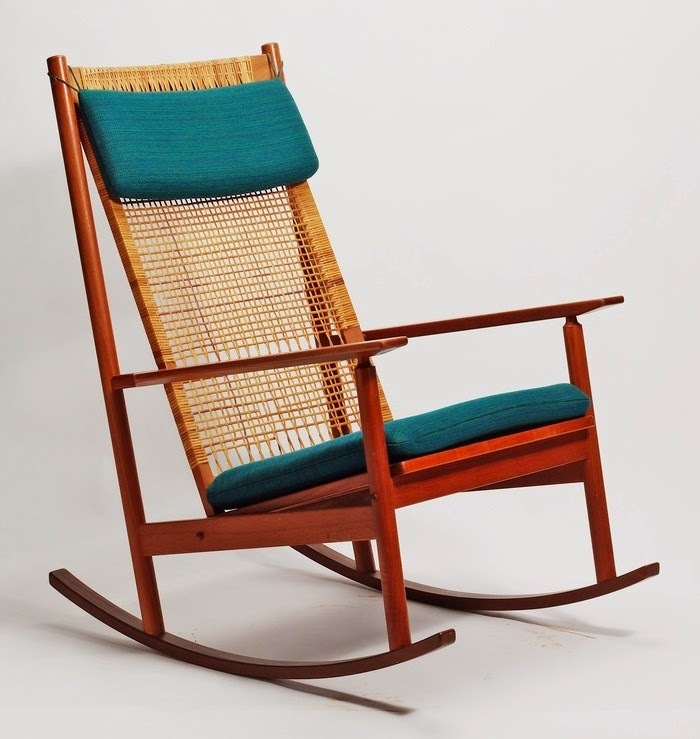 Sled chair - Verner Birksholm - c. 1957. Installation at the yearly Cabinetmakers' Guild - Ove Lander - 1951.
have neither heard or read a word of it from any other source so maybe the project has since been abandoned. I hope you’ve enjoyed this Hans Olsen bio. In the future I’d like to write similar posts featuring Danish architects Illum Wikkelsø, Ib Kofod-Larsen, Kurt Østervig and Tove & Edvard Kindt-Larsen. Nice post man! Indeed not much info on Hans, thanks for the share. I enjoyed reading your post for the history and the beauty of the designs. I, too, believe that many of the "minor" architects from the modern movement have been under-appreciated and that their collective oeuvre are where the true nature of the movement can be found. Keep at it - please! Martin Andersen. Awesome Inc. theme. Powered by Blogger. For the love of curves.